In the UK, the most common method of waste removal is by roadside collection. Typically households put their waste in bins and a fixed day in the week is allotted to the removal of this waste. The municipality or dedicated waste removal company is responsible for waste collection and removal. This waste is sent to transfer stations for bulking and compacting. Thereafter, it is sent to the processing facility. However, sometimes waste, such as e-waste, is exported to another country. On the other hand, high volumes of waste, such as that produced during refurbishment or construction of homes, extensive landscaping or spring cleaning, is put into skips and then hauled to the waste transfer station. When the waste is collected and sorted out, it often involves the workers having to manually pick up some materials wherein erroneously segregated waste is encountered. Thus, workers handling the collection and sorting are at a high risk for health problems. These health problems can range from simple ailments to life-threatening ones, such as tetanus. 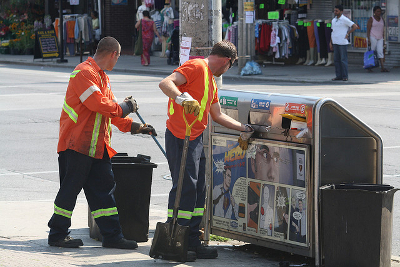 It goes without saying there is a real health hazard present for workers who deal with waste and recyclables. Employers are legally bound to assess and address the risk that their workers face while handling and sorting out waste and recyclables. They first have to identify the hazards and then the workers who are at risk. Thereafter, the risks from the hazards need to be pinpointed and proper control measures and systems have to be put into place to negate those risks. It is important to remember that without involving the workers and reinforcing health and safety issues through training and open and honest discussions, it is impossible to avert the risk that waste and recyclable health hazards pose. If handled correctly and carefully, rubbish removal can be completely safe and injury-free. This entry was posted in "The More You Know" "Waste Management" on Wednesday, February 17th, 2016 by 24/7 Waste Removal.